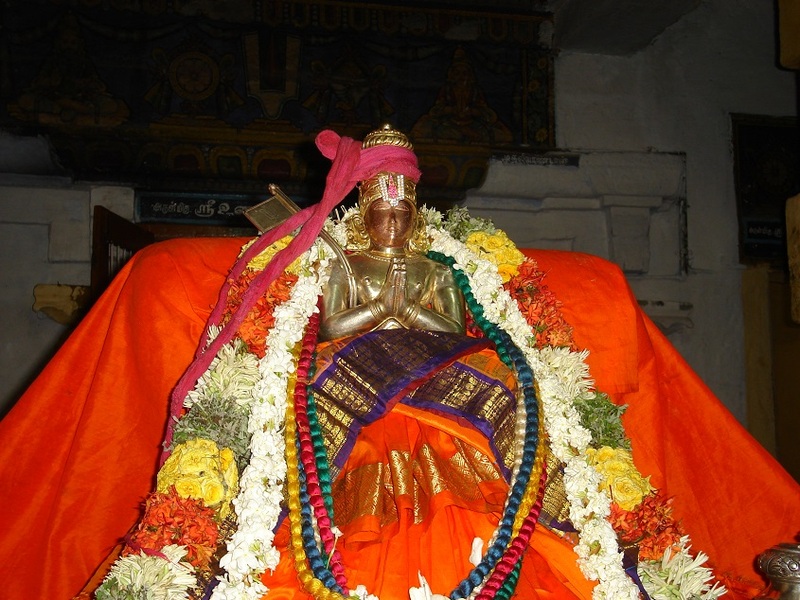 mAmunigaL being pleased saying “ethirAsarkkALAnOm yAm“, desiring to reveal the greatness of the divine name “rAmAnuja” which is different from and more ingenious than the divine name “nArAyaNa” which was previously spoken about in “mAkAntha nAraNanAr” and “nArAyaNan thirumAl“, does so in vyathirEka (negation). mAnusarAga enkol eNNuvadhE – how can they be considered as humans, they are similar to mere cows. There are three groups of people. For the sake of simplicity, lets us call them Group A, Group B and Group C. Group A are those people who does not say “irAmAnusAya nama:” day and night. People in Group B would never live in the company of Group A people. An example of Group B people is kUraththAzvAn. The last group of people, people in Group C are those who fail to recognize the greatness of people in Group B and so would never want to do incessant kainkaryam to them. mAmunigaL questions as to how can he consider people in Group C as humans, when in fact they are mere animals, such as a cow for their acts. mAmunigaL says “Each and everyone should mediate upon the sacred manthra of “irAmAnusAya nama:” incessantly. They should do this without differentiating between day and night, as described by the thirumangai AzhvAr in “naLLiruL aLavum pagalum nAn azhaippan (periya thirumozhi 1.1.15)”. Yet, there are lots of people who does not do this. One should realize that he or she should not be in the company of such people who does not meditate upon the sacred manthrA of “irAmAnusAya nama:”. He or she should never have any sort of attachment or affection with these people who are comparable to a cow. He or she (as the likes of kUraththAzhvAn et al), who lives by the SAsthra, should never be in touch with these kind of people. Secondly, it is important to know, understand and appreciate the greatness of this group of people who has no connection with the earlier group who does not meditate upon the sacred manthrA of “irAmAnusAya nama:”. To such elevated souls, one should strive to do kainkaryam eternally as revealed by thiruvarangathamudhAnAr in “eththozhumbum sollAl manaththAl karumathinAl seyvan sOrvinRiyE (irAmnusa nURRandhAdhi 80)”. People who does not do this kainkaryam to such elite people, are deemed to be worthy comparison to cows as pointed out by “mAnidavarallar enrE en manaththE vaithEn”. mAmunigaL finally concludes by asking himself a questions, “How can I consider these people to be humans in the first place, if they do not do kainkaraym to the group of people who does not stay in the company of the group of people who does not meditate upon the sacred manthrA of ‘irAmAnusAya nama:’? I can never imagine them as humans in the first place”. This entry was posted in Arththi prabandham, Other and tagged arththi prabandham, mamunigal, ramanuja on March 10, 2017 by santhanam rajagopalan.